Celebrating its 15th year, the BMW Charity Pro-Am tournament returns to The Reserve Course at Lake Keowee for the third time since 2000. Held May 14–17, the tournament is the only Web.com Tour event where amateurs and celebrities are grouped with Web.com Tour professionals in a four-day better-ball competition over three courses. 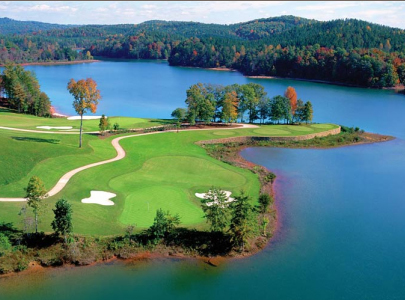 In addition to the Jack Nicklaus Signature Golf Course in Keowee, S.C., the other two layouts to be featured in the event are Thornblade Club and Green Valley Country Club. Amateurs, celebrities and pros rotate between three courses on Thursday, Friday and Saturday, with the 10 lowest-scoring pro-amateur teams, six lowest-scoring pro-celebrity teams and the lowest 65 pros (and ties) advancing to play Sunday’s final round at Thornblade Club. Celebrities play once at each course on Thursday, Friday and Saturday. The professional winner of the overall 72-hole event will take home $121,500 from the total purse of $675,000. All past winners of the tournament have gone on to play on the PGA Tour. To date, more than 120 celebrities, including NHL legend Wayne Gretzky, and actors Kurt Russell, Kevin Costner and Dennis Quaid, have participated in the tournament, which is broadcast by the Golf Channel. The 2014 tournament raised $836,883 for local charities, bringing the total raised since the tournament’s founding to more than $10.8 million. To learn more about the tournament, volunteer registration, sponsorships and playing spots visit bmwcharitygolf.com.